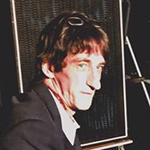 Alastair Artingstall has been part of The Divine Comedy’s road crew since late 2015. He has also worked as a tech/roady for other bands such as Ash, The Wannadies or Keane. Alastair is also an artist of his own, having released a couple of albums (Poet Servant Clown Queen in 2001 and Four Lawn Hope in 2006) and plays regularly acoustic gigs around London.